A huge number of industry icons are set to grace the Reboot Develop Blue stage in Croatia's Dubrovnik starting in less than 24 hours. The European event is kicking off tomorrow (Thursday, April 11th) and continues through to Saturday, April 13th, with some huge names from games development set to share their insight and experience. Amy Hennig - formerly of Uncharted maker Naughty Dog and EA's now-closed Visceral studio - is taking to the Bongfish Stage on Saturday for a fireside chat with former journalist Dan Pearson. Other mobile-related speakers include narrative designer Leigh Alexander, Round Zero CEO Daniel Rantala, Outfit7 VP of marketing Ziva Cizman, Remote Control Productions CEO Hendrik Lesser and Zynga SVP and head of corporate strategy, M&A and business development Chris Petrovic, amongst others. You can check out the full schedule right here, while the list of attending companies is here. Tickets can be found right here. Oh, and you can meet up with the Steel Media team at the show. 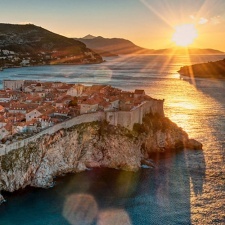 CEO and biz dev bod Chris James is going to be on the ground in Dubrovnik as is Ana Bogacheva from sales.